Mother’s Day is this weekend, and Mom deserves that day, that one day; to be pampered, waited on, and doted on, to be shown how much she is appreciated. While many of you will take Mom out for brunch at a fancy restaurant, which is totally awesome; others of you will choose to show Mom their adoration by cooking or baking for her, which is totally amazing as long as you do the dishes too! My Mama lives on the other side of the continent, in another country; so I won’t be spending the day with her. But when my Mama was here to visit me recently I did make these lovely Lemon Cream Cheese & Berry turnovers for her. Since I adore and love my mother, I wouldn’t serve her anything less than scrumptious. So you can be rest assured that your Mom would be absolutely delighted to enjoy these turnovers with her Mother’s Day morning coffee or tea! If you’re having a gathering, you may like to make a few baked goods. Roasting fresh strawberries intensifies the strawberry flavor in theses tender Roasted Strawberry Scones. I'm thinkin' that even The Queen would be pleased with these scones! Maple Glazed Whole Wheat Apple Bread. Apples and maple are a much loved classic! Here's what you do to make the turnovers. Don't throw the egg white away, it will be used later. Give it a whisk until the cream cheese filling is smooth. I like to defrost puff pastry in the refrigerator for about 24 hours. Remove just on sheet of puff pastry at this time and put the other back into the fridge for now. If you leave the second sheet out while working on the first it will warm up, get all stuck together and is a big ol' pain to get apart. Sprinkle a generous amount of flour on to a good rolling surface, a cold surface is best for pastry. Roll the puff pastry out to a 12 inch square. Cut the square into 9 equal smaller squares. Working in an assembly line fashion will make quick work of this. Drop about a tablespoon of filling into the center of each square. Drop a slightly heaping teaspoon of berry preserves on top of the cream cheese mixture. I used mixed berry preserves. Fold the pastry to make a triangle. Use a clean pastry brush to remove excess flour. The filling escaped from every single one of my turn overs. Thank goodness I had a second pan! Whisk the egg whites with about a teaspoon of water. Brush the egg whites over the entire top of each turnover. Sprinkle a little sugar over the tops. Put them into a 400 degree oven for 12 to 14 minutes; until they are crisp and golden brown. Serve warm or a room temperature with a lovely cup of tea! 2. Line two sheet pans with parchment paper, or silpat liners. 3. In a medium bowl using a whisk or a hand held electric mixer; mix together the softened cream cheese, confectioner’s sugar, lemon zest, lemon juice, and just the egg yolk. 4. Dust a smooth, cold surface (marble or counter top works best, not wood) generously with flour. Remove one of the puff pastry sheets from the package; return the other to the refrigerator for now. Place the puff pastry sheet on to the floured surface and roll it out to a 12 inch square. 5. Cut the 12 inch square into 9 equal smaller squares; a pizza cutter works really great for this. 6. Do these next steps; steps 6 through 10, in an assembly line fashion. In the center of each square, spoon about 1 tablespoon of the lemon cream cheese and top that with a slightly heaping teaspoon of berry preserves. 7. Fold the pastry over the filling; opposite corner to opposite corner, to make a triangle. 8. Use a fork to press and seal the sides closed; use a fair bit of pressure in doing this. 9. Use a clean pastry brush to dust any excess flour from the turn overs and lay them on to a sheet pan without them touching. 10. Whisk the egg whites together with about a teaspoon of water. Brush the egg whites on to the turnovers, completely coating the tops. Sprinkle about ¼ teaspoon of sugar over the top of each turn over. 11. Bake for 12 to 14 minutes, until the tops are a lovely golden brown color. 12. Remove the second sheet of puff pastry from the refrigerator and repeat the process. Lemon Cream Cheese & Berry Turnovers can be served warm or at room temperature. Note* These turnovers are a little tart, if you would like them sweeter, add 2 more tablespoons of confectioner’s sugar to the cream cheese mixture, and increase the amount of granulated sugar to 3 tablespoons which will allow you to sprinkle ½ of teaspoon of granulated sugar over each of the turnovers. Love these - what a great Mother's Day treat! Oh my gosh, these turnovers are definitely a perfect treat for my mother! I've never made turnovers and with your how-to pictures, you make it look like a cinch. A beautiful, tasty cinch. :) Hope you're having a great day!! I would SOOO love these. The flavor combos are perfect. Thanks so much for sharing at Weekend Potluck. These look delicious, Kari! 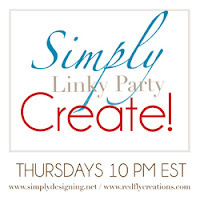 Thank you so much for sharing them at our Simply Create Link party! I am definitely going to have to try these soon! With such a treat I wish every day would be Mother's Day! Looks delicious, crispy and very tempting.